Eliot has changed a great deal since she bought her five bedroom home on Monroe Street from Palmer twenty-nine years ago. “When I first moved in I had my living room in the front. it didn’t take a week to move it in the back,” she says. But she stayed in Eliot and kept her ears open, bearing witness to its transformation as families have moved in and fixed up old dilapidated houses, high rise apartment complexes have gone up, gang activity has declined, and housing prices have increased. Wanting to stay better informed and get more involved in what was going on around her, Pat decided to start attending Eliot’s neighborhood association meetings in the late nineties and ended up joining the board. She stepped down for a while, but returned when her pastor at St. Philip the Deacon asked that a member of the parish volunteer to develop a connection between the organizations. It wasn’t long before Pat was back on the board and the Eliot Neighborhood Association was holding its meetings in the little church on Knott St.
“You’re driving down the street and all of a sudden this is up and this has changed and if you’re not part of the change you can’t complain about it. If you don’t go through the process and get involved, what can you say when it’s all done?” Pat explains. But listening means more to Pat than just knowing what’s going on. Wanting to encourage more people to engage with the neighborhood association, Pat helped to organize Community Conversations events, in which Eliot’s board invited neighbors to help guide the organization’s plans. “I want people to feel involved,” Pat says. These ideals extend to other areas of her life. Caring for others in the community is something Pat learned from her mother and it’s important to her that those values live on in her own children and grandchildren. When her kids were growing up she brought them to volunteer at the Albertina Kerr Center where her sister worked, believing that helping others from a young age would teach them to be compassionate. 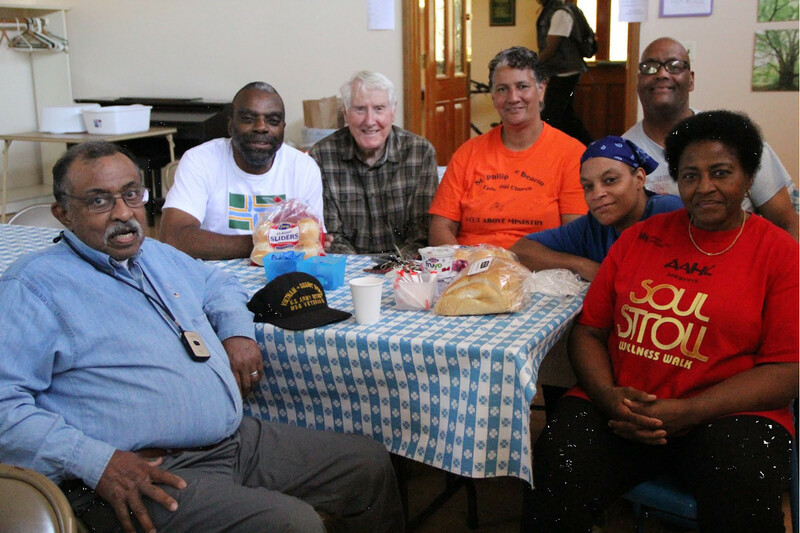 Whether she’s volunteering with St. Philips’ Community Lunch program, driving a Radio Cab, or welcoming new neighbors to the annual Fourth of July block party she organizes, Pat is getting to know members of her community, making them feel heard, and helping them to connect with others. Now in her late fifties, Pat is starting to think about retirement and says her plans may involve leaving Eliot. She is thinking about selling her home and moving to a smaller one in a less dense, less expensive area. She says she would miss the community here, but she doesn’t need such a large home anymore and worries that as she ages the increasing density of this neighborhood will make it an uncomfortable place for her to live. Her own grown daughter is currently unable to afford rent in the area. She’s also watched families leave because of the increasing density’s impact on the livability of the area. Previous PostReasons To Join Our BoardNext PostHungry for Lunch or Need Meals Delivered?